The Lemur Leaf Frogs are naturally lean tree dwellers with big silver eyes with a jet black outer ring. They are quite impressive in person and one can see the resemblance to a bug-eyed lemur when those big eyes pop open! 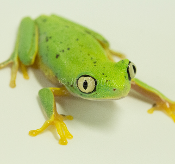 As juveniles, the Lemur Leaf frog exhibits are vibrant lime green coloration. As they mature, dark spots will appear on the skin The Lemur Leaf frogs give the appearance of being quite frail with their skinny legs and arms, but they can move quite adeptly, and quickly, when the mood strikes. They are a smaller tree frog with males ranging from 1¼ to 1½ inches, while female range from 1½ to 1¾ inches on average. Interestingly, the Lemur Leaf frog tadpoles will complete metamorphasis at nearly 1 inch in size and grow quite quickly.